Catering to a wide range of patients during the day can take its toll on any caregiver whether it’s a doctor, therapist, or any other caregiver. Treating patients in a seated position can be beneficial to every doctor, therapist, or clinician since it can remove the possibility of straining the lower back in any type of hospital or inpatient facility. An ergonomic medical stool can aid in this endeavor, but sometimes getting the patient out of bed safely can also be a challenge. A bedside footstool can alleviate some of this danger. Combined, medical stools with wheels and bedside footstools make treatment easier. The ability to maneuver freely is what Adjustable Pneumatic Medical Stool offers. The five leg base with swivel casters can easily be moved around while keeping your hands on the patient. 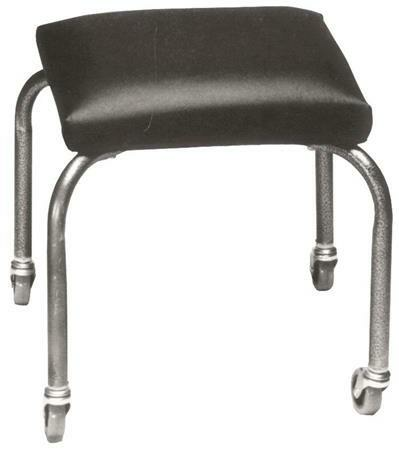 Able to adjust vertically 17-22 inches with a single, smooth pneumatic mechanism, this adjustable physician stool allows the clinician or therapist to work comfortably at the appropriate height. With a seat diameter of 15 inches and a high density 3 inch foam pad, comfort is paired with easy maintenance by simply using a 10% bleach 90% water mixture to maintain and clean this rolling medical stool. For any doctor or therapist who may need to sit at a lower height, this hospital stool sits at a comfortable 18 inches tall. Made from all welded steel construction, its durability is only matched by its comfort. 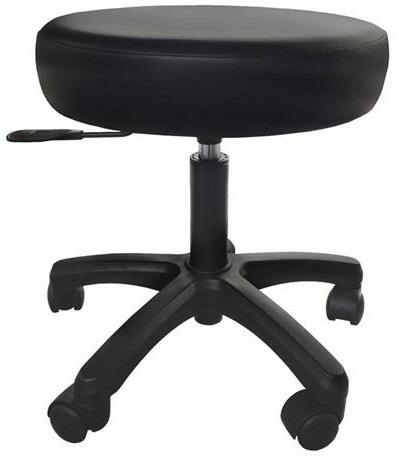 This Mobile Stool has four swivel casters that can support up to 225 pounds and the 14 x 14 padded 2 inch foam seat adds comfort. The vinyl covering on the seat is simple and easy to clean as long as harsh chemicals are avoided during cleaning to ensure the vinyl doesn’t crack. Sometimes entering and exiting bed can be a difficult endeavor for those with limited mobility. 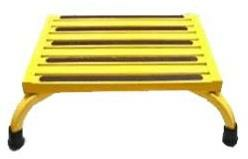 The use of a bedside stepstool such Chrome Footstool with Rubber Mat can make entering/exiting bed safe and more secure. With the height of 8.25 inches and 17 weld points, it has four legs that can support up to 350 pounds. To further enhance safety, it has rubber matting with a nonslip surface measuring 12 x 16”. Patients with mobility issues can benefit from a foot stool that incorporates a gentler grade. Nestable Foot hospital stool can be used bedside even at home. This set of four Birchwood steps is coated with a natural poly wood finish and topped with nonslip abrasive strips. Use all four and then store them inside of each other to maximize available space. Bariatric patients have a need for stronger more durable equipment. With a weight capacity of 1000 pounds, this bedside stool measures 15 x 19” and has an anti-tip wide base due to a unique self-leveling structure. 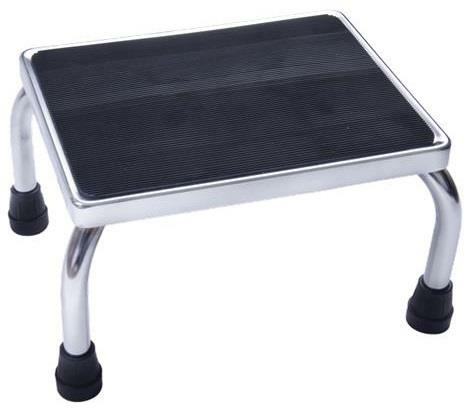 The top platform of Bariatric Lo-Commercial Step Stool is made from tubular aluminum that has non-slip gripper strips. Weighing only 8 pounds and 8 inches tall, this patient stool can handle up to 1000 pounds and can safely fold to 3 inches thick due to its unique double locking safety legs. 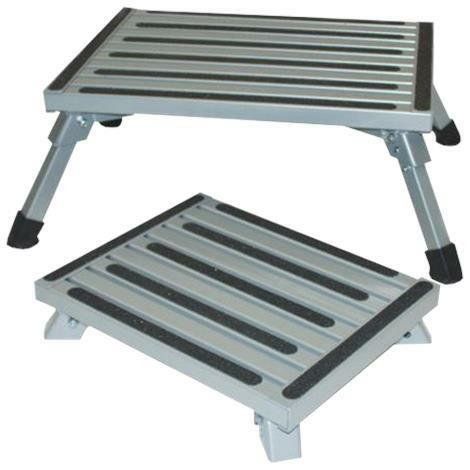 Bariatric Large Folding Step Stool also features a unique self-leveling structure which creates a wide tip base that prevents these steps from tipping over therefore increasing stability and safety. The nonslip gripper strips adorn the tubular aluminum platform that measures 15 x 19”. Safety and comfort for both patients and doctors/clinicians can help any treatment be more effective. Any recovery is benefited from your doctor or therapist being comfortable and avoiding any back strain or injury. Whether in a hospital facility or in the home, an ergonomic medical stool or bedside step stool makes good sense. Working in comfort and/or stepping down/up in a safe manner is important to both the caregiver and the patient alike.